Create some art work your antworks habitat. Ok so your ants have tunneled and have finally expired. R.I.P. Well what can you do with that beside add more ants or new Replacement gel which by the way he have? Buy the Sculpture kit for the AntWorks and you are ready. With The Sculpture Kit Its an easy process. Pour the clear resin into your habitat and let harden. Rinse away the loose gel and you are left with a permanent work of art that resembles and sculpture made by Picasso. 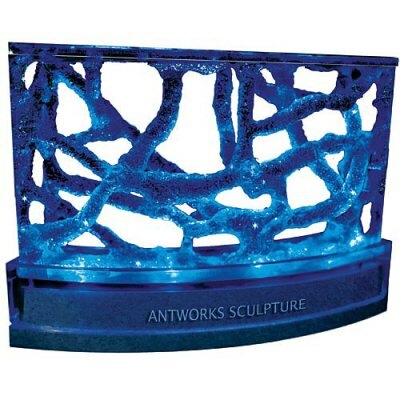 AntWorks LED base (included) to illuminate your crystal-clear sculpture with a blue glow that is simply beautiful. Remember the Past with the Sculpture Kit + Illuminator. If you would like replacement Ant gel shoot us an email.